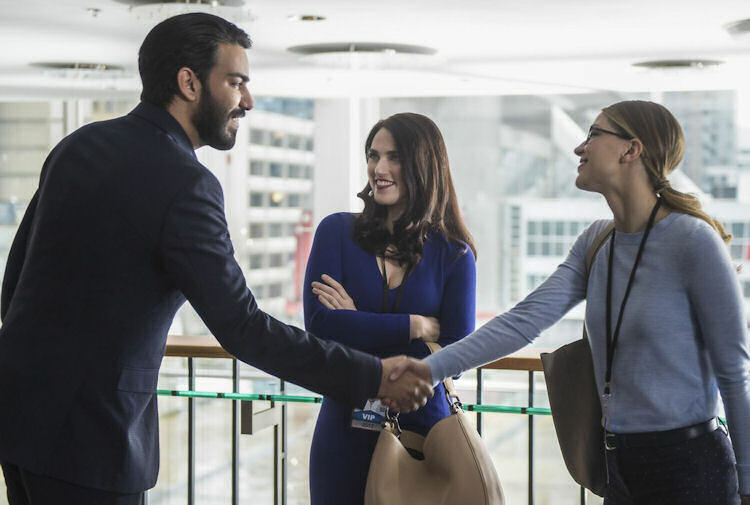 As Supergirl returns from its extended spring break, Kara and the gang shy away from the Mon-El melodrama that dominated the previous stretch of episodes in favor of a monster-of-the-week story that helps Kara focus on Kara. She has run into the same wall that most recently unemployed people run into; once that dusty to-do list is done then boredom sets in. Kara doesn’t even have her side gig as Supergirl to help bide the time, as things are quiet on the intergalactic justice front as well. Luckily for Kara, Lena Luthor has come to rescue her from the malaise and help get her back on the journalism horse, thanks to an extra media pass for the tech demonstration of an old flame. Just a quick side note here. While it’s nice that the series is trying to give Kara a life outside of the cape, does it have to be journalism? It’s well established that Kara is neither a very good nor a particularly ethical reporter. Isn’t there some other career path she might want to follow? No? All right, I tried. The demonstration by Jack Spheer involve some nanobots that could revolutionize medicine. Lena is aroused, both by the science, and the dashing figure cut by her former lover/lab partner. Kara crosses paths with her nemesis/former boss, Snapper Carr, but Kara awkwardly wins the day by getting out a “hard hitting” question about FDA compliance before Snapper. This sets a chain of events that drives the plot the rest of the episode. While Lena and Jack start to reconnect, Kara is approached by a whistle-blowing Spheerical employee who has the dirt on the nanobots. Their later meeting goes about as poorly as you might expect, as the whistle-blower is killed by a giant cloud of tiny robots. Meanwhile in B-plot land, Jimmy is fighting his ongoing battle with irrelevance. This time, he’s letting Winn’s super strong, super unstable alien girlfriend come along as a sidekick. Score another point for irrelevance. Kara gathers more information and eventually turns most of it over to Snapper because she believes getting the info out to as many people is possible is more important as getting the personal scoop. Aww that’s so noble. Have you considered working at Cinnabon, Kara? It turns out that Spheer is the killer cloud of nanobots. In lieu of proper trials, he just injected the bots into his hand and turned into a Jack shaped mass of robots (don’t ask, it’s Fake Science). The big twist is that the bots take your free will away, and Jack is actually a puppet of his CFO with the evil-looking Bluetooth earpiece. The big fight of the show is actually between the “did I mention I was a black belt?” CFO and “did I mention I was a Luthor?” Lena. Being a Luthor makes Lena a bigger badass, but it also gives her an impossible choice, as the bots are slowly trying to suffocate Kara. If she hits the override button, it will kill her former lover, and save her potential one. Left with no other choice, Lena hits the kill switch. In the end, Kara gets her old job back thanks in part to Snapper’s temporary insanity admiration of Kara’s reporting skills. Lena is left in a vulnerable state because she had to kill her former lover. Kara tries to be all intimate and caring, but as Mon-El’s mom enters the picture, Lena is sure to be led down the wrong path. The episode’s insistence on giving Kara her journalistic cred back notwithstanding, this was a perfectly serviceable episode. The Jimmy stuff, as always, was a little clunky, but the dynamic between Lena and Kara is interesting and the nanobot effects were largely cool. It was a good, not great, setup for the end of the season.